Years ago, I overindulged on prawns, whilst on holiday in Margate and for years thereafter I never ate prawns. I must admit it might not have been the prawns but the amount of bubbly I consumed that might have given me the “out-of-body experience” that night. A couple of years later, on a work trip to Cape Town, I had another bad experience with prawns. I was still living in Pretoria at that stage and myself and some colleagues came to Cape Town for a 2 week period to do a tender evaluation. One of the evenings we landed up at Mariner’s Wharf in Cape Town for dinner. One of my colleagues ordered prawns for a main dish. About a minute after the main dish was served, the lady that ordered the prawns, burst into tears. Needless to say we were all very concerned by this big show of emotion. Was she missing home; did someone say something to upset her… or what else could be causing this misery? After she sobbed for, what felt like hours, we could hear her mumbling something. I looked at one of my male colleagues and asked: “Did she say the prawns’ eyes are looking at her?” He thought so too and decided to make her feel better by banging on the prawns with his knife saying: “Don’t worry – look it is just plastic.” She started crying even louder and left the restaurant very traumatized. The ladies at the table felt very sorry for her and all try to console her. The males, howver, were all having a feast consuming her prawns (so that she won’t have to face their eyes once she returns to the table, you understand?) My poor lady friend went to bed hungry that night. After moving to Cape Town, there were just too many invitations that included prawns as a dish and my resistance crumbled soon. I don’t know whether this ex-colleague of mine ever tried eating prawns again after that experience, but I am so glad that I did! 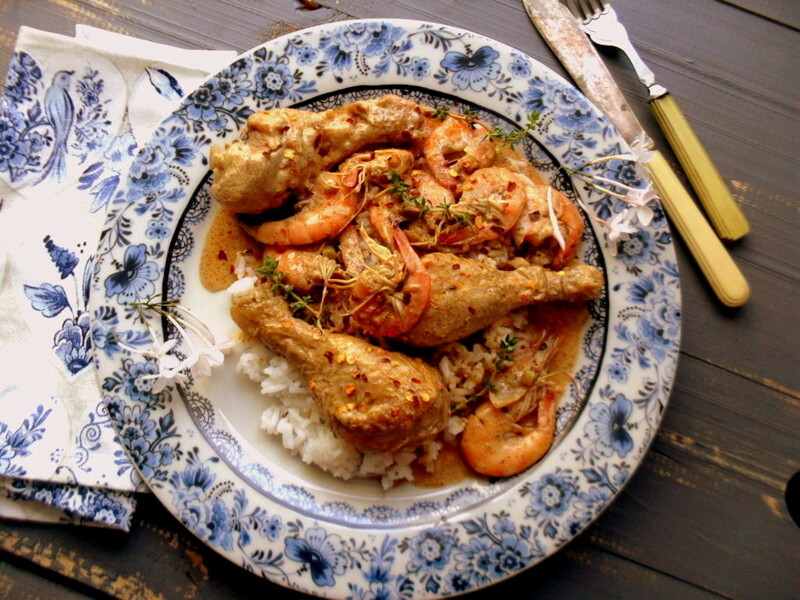 This chicken and prawn curry is an easy and quick mid-week dish to prepare. I served it with jasmine rice. 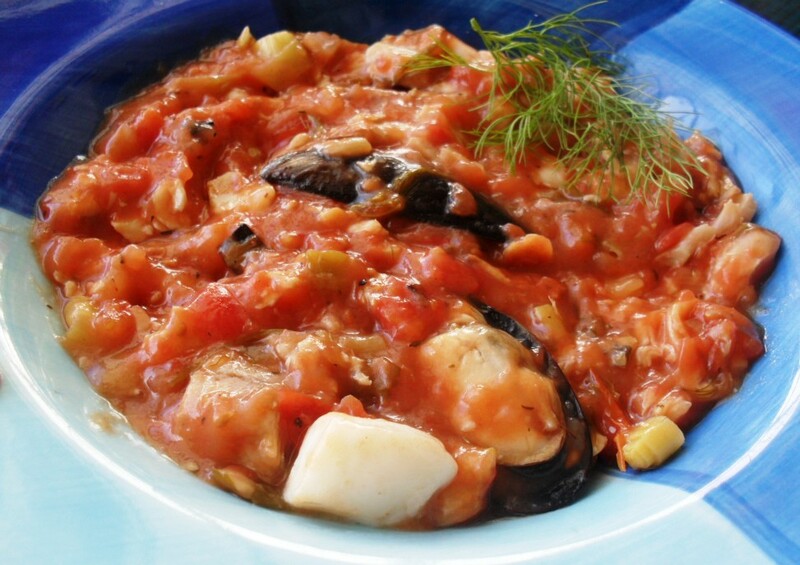 This is definitely not a new recipe, but still a great dish to prepare for family and friends. 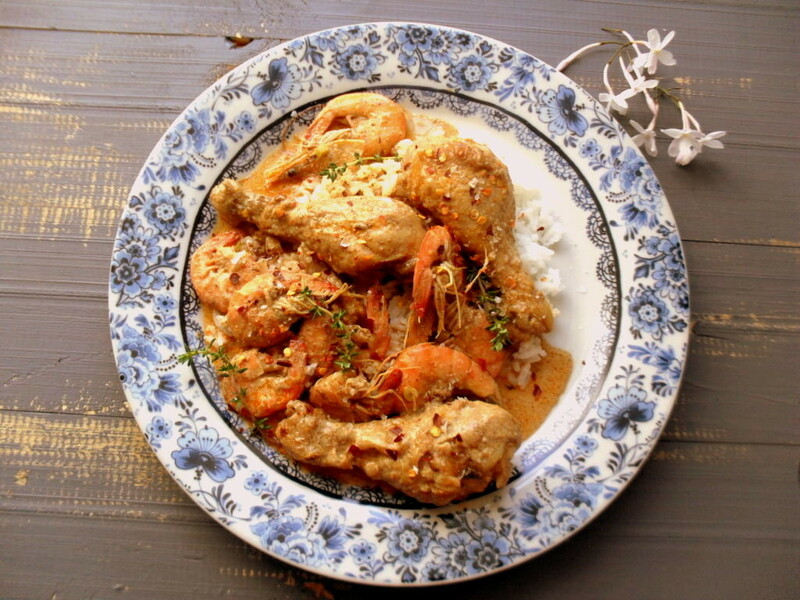 The addition of lemon grass to the chicken and prawn curry adds a fresh tang to the curry and the optional dried chilli flakes adds more heat and a bit of colour. 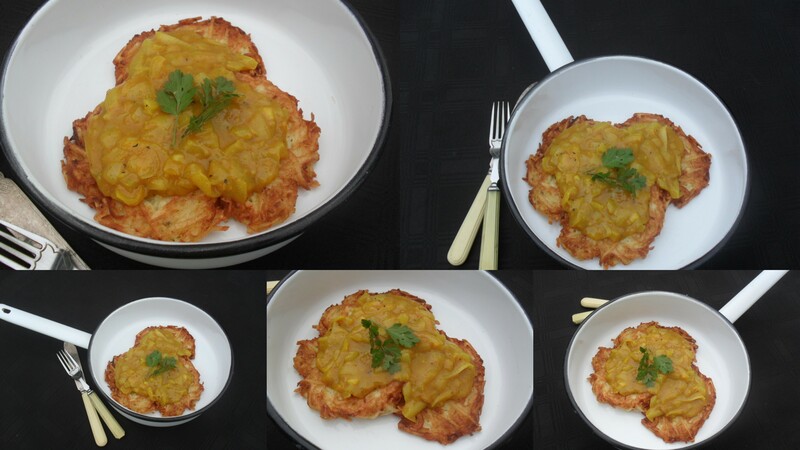 Enjoy the dish and remember to have fun in the kitchen! Heat the olive oil and butter in a heavy based pot. Add the cumin, coriander, paprika, chilli powder and garlic to the oil and sauté for 2 to 3 minutes. Add the chicken portions and fry for 2 to 3 minutes, turn and shake and ensure that all the chicken pieces are coated with the spices. Fry for another 4 to 5 minutes. Add the lemon juice, lemon grass and approximately 125ml water. Simmer on low heat for about 30 minutes or until the chicken is cooked through. Add the prawns and season with salt and pepper. Cook until the prawns turns pink; about 3 minutes. Add the coconut cream and simmer until the coconut cream is just heated through. Garnish with thyme and dried chilli flakes. Yes, she was very sensitive! I am so glad you found me! I must admit I also prefer prawns without the heads! As not really being a curry fan, I would probably find this acceptably delicious with all the burny bits left out! Or do you think that would then call for a fresh ‘theme’ flavour? Yes, I remember that you are not a curry-fan! What a pit I don’t have any prawns. This would be perfect to share with my brother and his family who are visiting at the moment. It is an utterly delicious dish, Mandy! Delish! Love the combination of chicken and prawns. 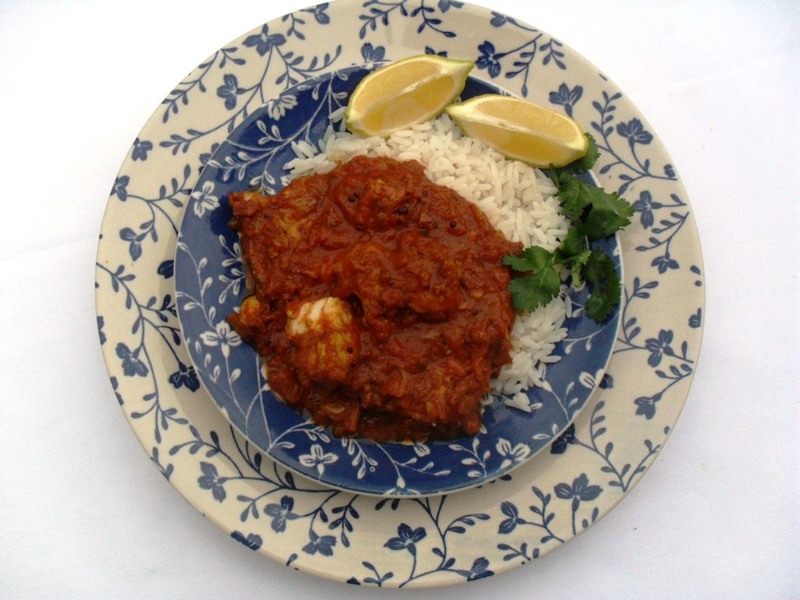 Summer or winter, a good curry is always a crowd pleaser. 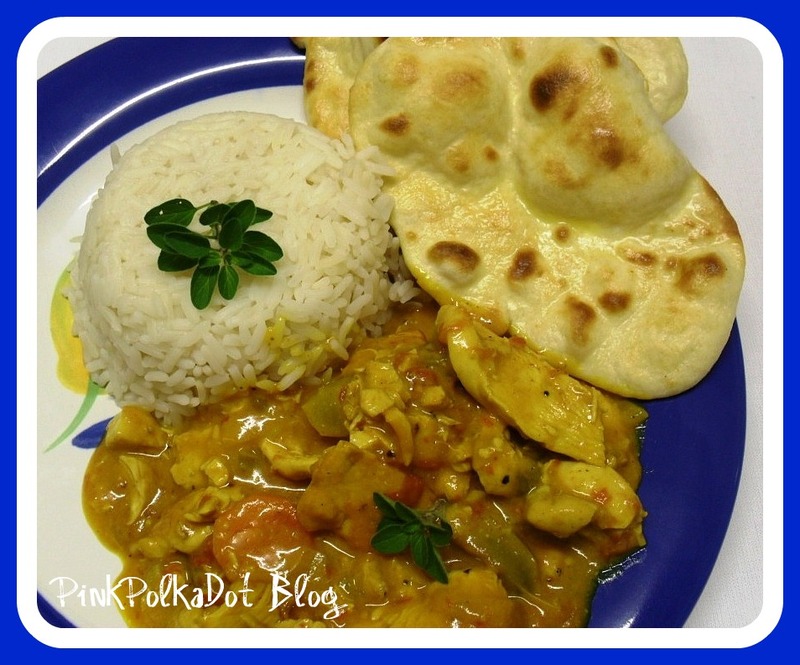 I agree – I love curry! I didn’t used to eat prawns but now they are a favorite. 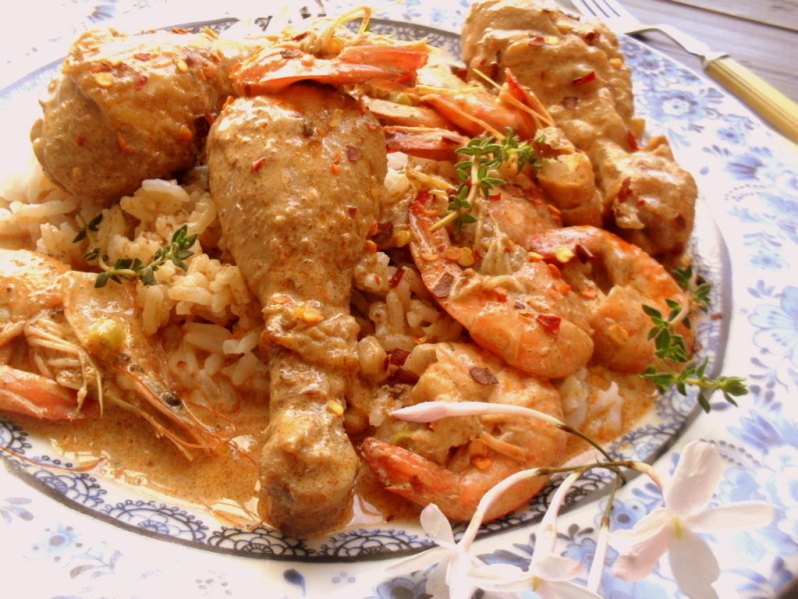 Your curry of chicken and prawns sounds terrific. I looooove prawns and I am eating heaps at the moment!